Many people are surprised to learn that children can suffer from some of the same mental health conditions as adults. Anxiety disorders, in particular, are likely to affect someone under the age of 18. Some anxiety disorders which are most commonly found in children are social anxiety disorder, Obsessive-Compulsive Disorder (OCD), and generalized anxiety disorder (GAD). Social anxiety disorder causes an intense fear of being negatively viewed or judged by others. In children, social anxiety can cause difficulty making friends. This can lead to feelings of isolation and frustration. Social anxiety can also make a child reluctant to answer questions or speak in class. In severe cases, children with social anxiety can develop school anxiety. This fear can make it very difficult for a child to attend school every day. Obsessive-Compulsive Disorder is a condition which causes recurring thoughts and irrational behaviors. The thoughts cause high levels of stress and anxiety while the actions, which are usually bizarre or excessive, provide a temporary sense of relief. Children with OCD will often be plagued with worries about safety and health. They may display an unusual amount of fear for the well-being of their family or themselves. They may also express an unreasonably strong fear of germs and situations which can expose them to germs. One symptom frequently seen in children who have extreme OCD is excessive hand washing. In a situation like this, the child — fearing contamination by germs and subsequent illness — may wash his or her hands to the point of self-harm. Generalized anxiety can be more difficult to diagnose in a child. The condition is characterized by long-term, chronic anxiety. The focus of the child’s anxiety does not need to be one particular object or situation; rather, the child will feel overly anxious about a variety of things. The anxiety will be present in a number of situations, many of which do not warrant such a high level of worry. The first thing concerned parents should do is to find out how their child is feeling. Talking to the child about his or her worries is very important. It is also helpful to speak with the child’s teacher to see how behaviors at school may differ from behaviors at home. 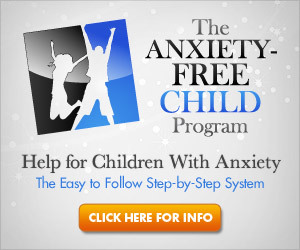 Some children may be withdrawn at school because they don’t know how to deal with their anxiety. Others may even act out to vent their frustration. Another critical step for parents to take is to seek a professional opinion on their child’s condition. This can provide parents with a solid, factual diagnosis. Once other illnesses and conditions are ruled out, choosing a treatment method suited to the child’s needs should be easier. Some of the treatment options recommended by mental health experts are cognitive-behavioral therapy and family-based therapy. These types of therapy can be highly effective and are often tailored to the child’s level of comprehension and overall maturity. Art and music therapy can also be fun, creative methods of treatment for children with anxiety disorders. They are less structured than other forms of therapy and allow children to express themselves while feeling safe and encouraged.